It seems only fitting that in a year where so many failed hopes, aspirations, and expectations were dashed with a brutal reality check, the Redskins season would come to a close with yet another failed comeback attempt against a division rival. Down 17-14 with just over two minutes to play, the Redskins began what could have been the game-tying (or game-winning) drive from their own 17 yard line. However, they could only muster 19 yards in 68 seconds, with the drive ending on quarterback Rex Grossman’s incomplete pass to Terrance Austin on 4th and 4. Grossman – the subject of much scrutiny over the last few weeks, given that these last three games of ’10 served as his “audition” for remaining with the Redskins in 2011 – had another up-and-down day. While the boxscore may show 336 yards and two touchdowns passing, he also had an interception and lost two fumbles during crticial junctures of the game, doing nothing to dispell the notion of being a turnover-prone quarterback. The Giants opened scoring on the afternoon on their second drive of the game much in the same way they did the last time they played the Redskins, by running the ball right down the throats of their opponents. New York’s 11 play, 78 yard drive (54 of those came on the ground) resulted in a 20 yard field goal by Lawrence Tynes, putting the visitors up 3-0. The Redskins appeared to have a great chance at answering this score, after cornerback Phillip Buchanon intercepted a tipped pass intended for Mario Manningham on the Giants subsequent drive, giving the Redskins the ball on the Giants 25 yard line. But just three plays later, Grossman was sacked by Osi Umenyiora, which caused a fumble that was recovered by New York. 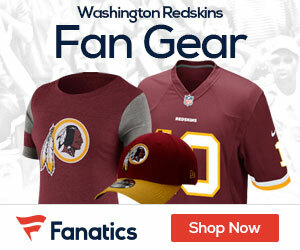 While the Giants could not capitalize on the Redskins mistake, they did put together a nine play, 68 yard drive on their next possession, which was capped off by a two yard touchdown run by Brandon Jacobs, who barreled through several Redskins defenders for the score. But the Redskins would answer back as the first half was coming to a close. Resembling his performance in Dallas in the second half of that game, Grossman completed five of six passes for 79 yards – helped by some outstanding playcalling and execution – and found tight end Fred Davis for a one yard touchdown pass to cut the score to 10-7. 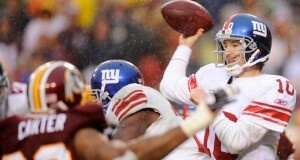 However, with the second half not even two minutes old yet, the Giants would extend their lead. Pinned back deep in their own territory, Manningham beat newly-named Pro Bowl cornerback DeAngelo Hall on a go route, and Eli Manning hit him perfectly in stride for a 92 yard touchdown pass. That marked the longest scoring play of the season for the Giants, and the longest scoring play the Redskins have given up in over 25 years. Late in the third quarter, the Redskins appeared to be gaining some momentum and moving towards a potential score. After holding the Giants to back-to-back three-and-outs, the Redskins began a drive at their own 24 yard line and eventually moved the ball down to the Giants 35. But on the very first play of the fourth quarter, Umenyiora once again beat Trent Williams around the edge, sacking Grossman and forcing yet another fumble that was recovered by the Giants. The Redskins still manged to put themselves in a position for a comeback, although likely later than they would have liked. Grossman hit Anthony Armstrong for a 64 yard touchdown pass with 6:02 remaining in the fourth quarter, cutting the Giants lead to three. But the Giants would run over three and half minutes off of the game clock on the ensuing possession, forcing the Redskins to use all three of their time outs to preserve any potential for a comeback. Amidst the loss, the only consolation Redskins fans could find was news that the Giants victory ultimately proved meaningless for their playoff hopes. Once news emerged that Green Bay had defeated Chicago and clinched the final playoff spot in the NFC, chants of “Green Bay won!” began to spread in the stadium, with the fans trying to find any type of silver lining in an extremely frustrating season. The Redskins will finish the 2010 season with a record of 6-10. Since theor bye week, when they entered the second half of their season with a 4-4 record, the Redskins went 0-4 against their NFC East opponents and 2-6 in their last eight games overall. They finished the year with 2-6 record against their NFC East rivals as well, with their last victory coming in the first weekend of October.